As if having President Aria show up as a bowling alley mascot wasn't enough, Akari makes an appearance too! Okay, sure, it's actually after the credits roll on the last episode of Sketchbook, but there she is. There is a little bit of backstory here, of course. 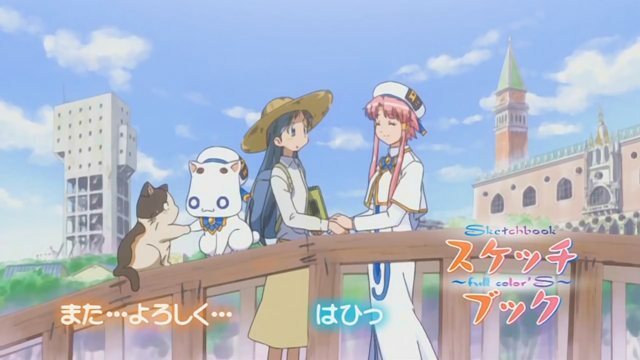 Both Sketchbook and the ARIA franchise were animated by Hal Film Maker, and ARIA the Origination was their next show to air. In fact, I seem to remember reading somewhere that they even ran in the same timeslot. I really enjoyed Sketchbook, at least until Kate the Canadian otaku shows up. At that point, my skin began to crawl a little bit, but not enough to truly dampen my enthusiasm for the show. My recent rewatch of the series just confirmed that opinion, both of the show and of Kate. If you liked ARIA or Hidamari Sketch, you'll feel right at home with Sketchbook. Post contains 160 words, total size 2 kb. 1 GA > Hidamari > Sketchbook. 2 You can say it as many times as you'd like, but it's still incorrect. 21kb generated in CPU 0.04, elapsed 0.1875 seconds. 47 queries taking 0.1638 seconds, 246 records returned.